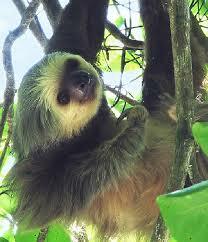 Here is a Hoffmann’s two-toed sloth just hanging around. I think that sloths are cool, so today I want to write about Hoffmann’s two-toed sloth. These lovely animals grow up to 72 cm long and have a short stubby tail. Up to two-thirds of a sloth’s weight can be made up of the leaves in its belly. Despite spending their entire lives in trees, they come down once or twice a week to do a poo. I don’t know why they don’t just do a poo from up in the tree as they are very vulnerable to predators when they are on the ground. The normal colour of a Hoffmann’s two-toed sloth is shaggy and brown, but they are so slow that algae grows on their fur. This actually helps to camouflage them in the trees which saves them from a range of predators, including jaguars, harpy eagles, ocelots, margays and anacondas. They can use their long claws and sharp teeth to defend themselves. Some people think that they are lazy, but they are just conserving energy. Most of their diet is made up of leaves which can take up to 1 month to digest, so they don’t have much energy. Their long claws are used to hang from branches and they spend most of their lives upside down. They may be slow, but they are excellent swimmers. Hoffmann’s two-toed sloth lives in rainforests in two large regions within central and South America, one that ranges from Honduras down to Ecuador and the other that covers part of Peru, Brazil and Bolivia. They are not considered in danger of extinction, but they have been impacted by habitat loss. Are there any other interesting facts that you would like to share about Hoffmann’s two-toed sloths?